Marie-Luise Neunecker has excelled as an orchestral musician, soloist, and teacher. She has won competitions, served on competition juries, and recorded concertos and chamber works. Among her premieres is György Ligeti's Hamburgishes Konzert, which was composed especially for and dedicated to her. 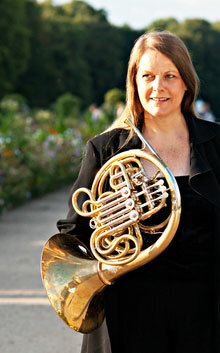 Marie-Luise was born in 1955, first studying musicology and German, then completing her horn studies with Erich Penzel at the Hochschule für Musik Köln. Her playing career began with the Frankfurt Opera. In 1979 she was appointed principal horn with the Bamberg Symphony, followed by principal horn with the Frankfurt Radio Symphony (1981-1989). Marie-Luise won the German Music Competition in Bonn (1982), ARD International Music Competition in Munich (1983), and Concert Artists Guild competition in New York (1986), and was awarded the Frankfurt Music Prize in 2013. She has appeared as soloist with orchestras around the world. In addition to the Ligeti concerto she has recorded works by Mozart, Strauss, Britten, Hindemith, Gliere, Glazunov, Schoeck, Shebalin, Koechlin, and Smyth. Volker David Kirchner dedicated Orfeo for baritone, horn, and piano to her. She has participated in festivals including Salzburg, Schleswig-Holstein, Marlboro, Aldeburg, Risör, and Vienna. Marie-Luise was appointed professor at the Frankfurt Academy of Music and Performing Arts in 1988 and has been professor at the Hochschule für Musik Hans Eisler in Berlin since 2004. She wrote about preventing dystonia in the May 2017 issue of The Horn Call and was a featured artist at the 2017 IHS International Symposium in Natal, Brazil. She was elected an IHS Honorary Member in 2017.